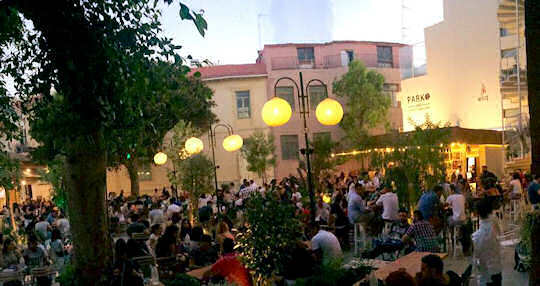 Whilst dreaming of her beaches, olive groves and mountains, don't forget Kriti's thriving towns. 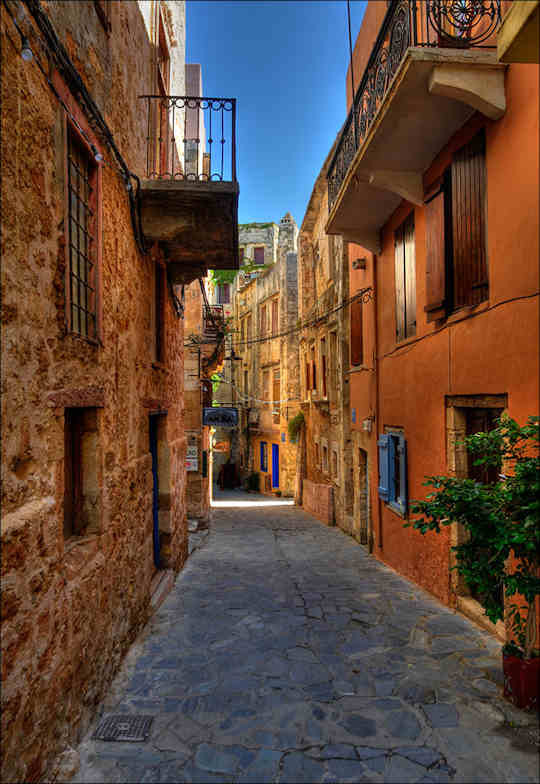 With a total population over 620,000 Crete welcomes nearly 4 million tourist visitors every year. Many Cretans live in the four capitals; or share their time between the capital and the village. Each has a different character and pulse for the traveller to discover. 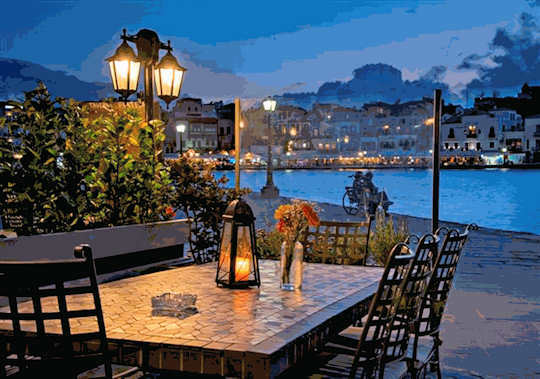 Chania Χανιά, with its picturesque Venetian harbour is a fascinating blend of the modern and historic patchwork of Cretan life. Built on an ancient site, the old town with its narrow twisting streets, art galleries and cafés is characteristic of Kriti's wealth of culture. Ferries arrive into Souda port near Chania and flights arrive into Chania Airport, both just 15 km from town, capital of the western Region of Chania. 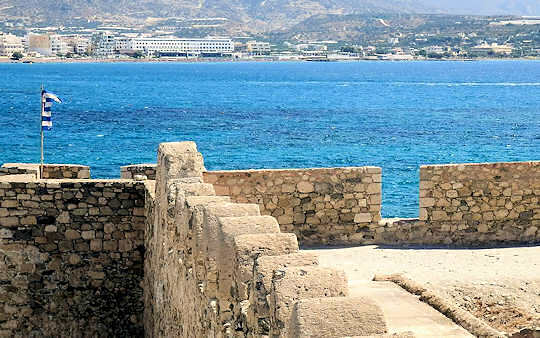 Rethymnon Ρέθυμνο surrounded by beaches and crowned by the ruins of a Venetian fortezza, Rethymnon also has a contrast of historic and modern architecture, with excellent restaurants and cafés. The University of Crete is based just outside of town. 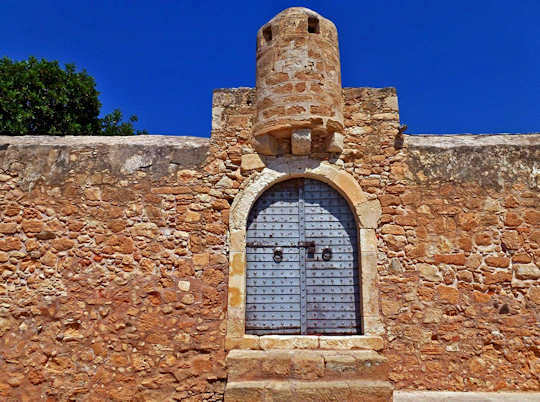 Capital of the Rethymnon Region, this busy town is well located in the central north of the island, making it a good choice for exploring all regions, and north and south coasts. 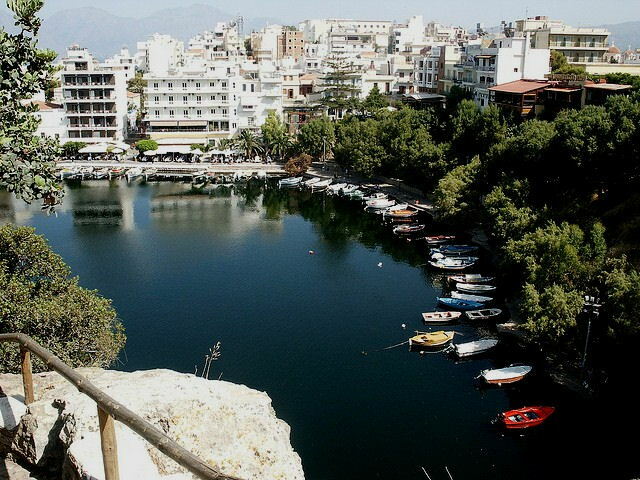 Heraklion Ηράκλειο is the capital of the island and one of the most wealthy cities in Greece. It is modern, upbeat and diverse. 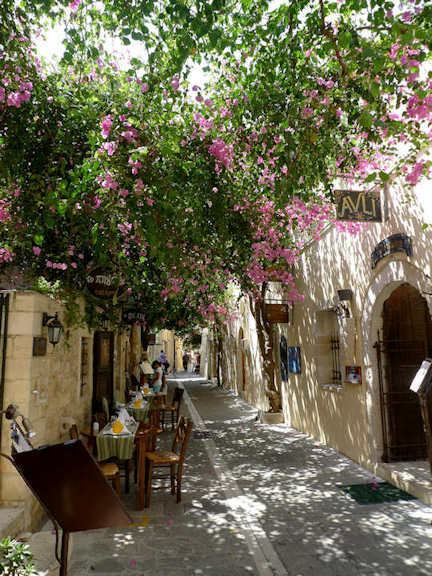 We are happy to share our knowledge of the town to those who might think to overlook it, there is plenty to see and do in Heraklion. Ferries arrive into Heraklion Port just 1 km from town and flights arrive into Heraklion Airport just 4.5 km from the centre of town. Many visitors come into Heraklion to see the ancient site of Knossos and the other sites of Phaistos and Malia, historic locations of importance in the Minoan era of the island's past. 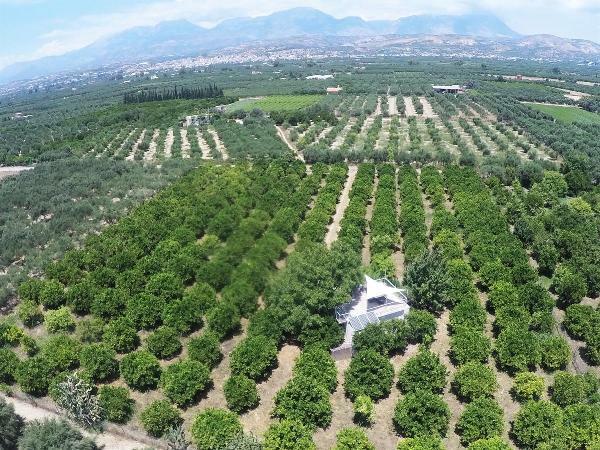 The Heraklion Region boasts mountains and beaches, wineries and olive farms. From here, visit the Region of Lasithi with mountains and plateaux, gorges and beaches, loads of wide open spaces and a rich food culture. 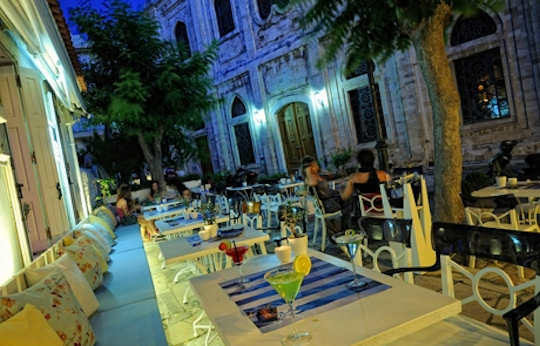 Some of our smaller, regional Cretan towns follow below. 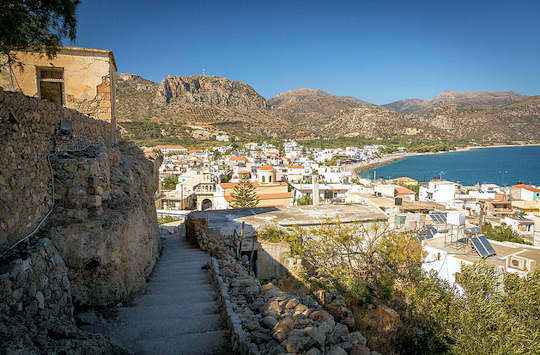 Kastelli-Kissamos Κίσσαμος on the north-west coast of Crete, is a small coastal town with an interesting history. Pirate Barbarossa was active here. Some of the most beautiful wild beaches of the island are nearby, such as Balos Lagoon, Gramvousa Islet and Falassarna Beach. Paleochora or Palaiochora Παλαιόχωρα on the south-west coast of Crete, is where the mountains meet the sea. This charming small town or large village juts out on a peninsula into the sea. From here you can beach hop, hike in the Lefka Ori, or sail to Gavdos Island. Whales and dolphins can be seen in these clean turquoise waters. Walk the E4 European hiking trail, relax at numerous beaches or explore the mountains. Visit the pristine undeveloped beach of Elafonisi from here by boat, or take the south coast ferry along to tiny inaccessible villages such as Sougia, Agia Roumeli and Loutro. Moíres Μοίρες in the Messara of Iraklion, in the centre of the island, is a busy market town. The Messara is a huge central valley rolling north to south in the middle of the island. It has been written about, fought over and appeared in mythology. Today Mires is a vibrant agricultural community, with a huge market every Saturday. It is close to the ancient sites of Phaistos and Gortys, and the villages of Zaros and Kamilari. 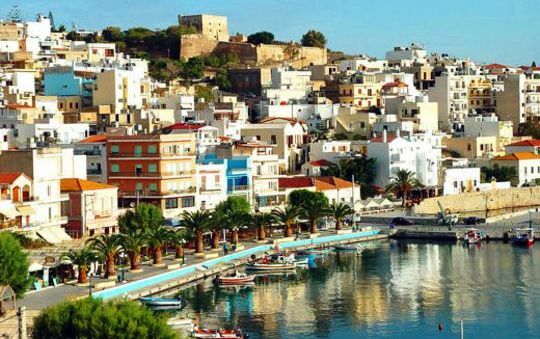 Sitia Σητεία in the east of Crete is not often visited by tourists, however travellers will find plenty of interest here in this solidly Greek town. 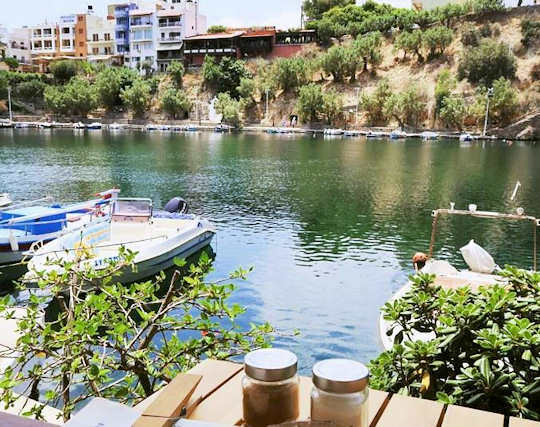 As Lasithi has a vibrant agricultural activity, especially with the olive harvest, Sitia is a wealthy town, over-looking beautiful Sitia Bay and surrounded by the wide open landscapes of Kriti. The name Kazarma derives from 'Casa di Arma' from the Venetian occupation. Now it is a ruin after an earthquake in 1508 and an attack from pirate Barbarossa in 1538. 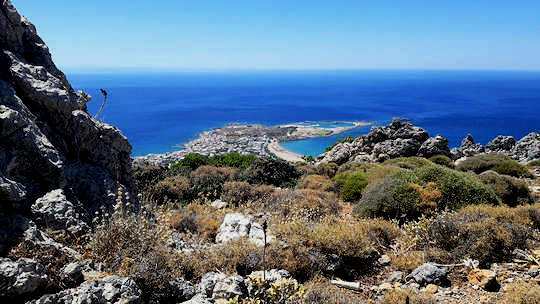 Ierapetra Ιεράπετρα is a large town in the south east of Crete, surrounded by beautiful beaches and rugged mountains. Access the remote and uninhabited Chrissi Island from here by boat. 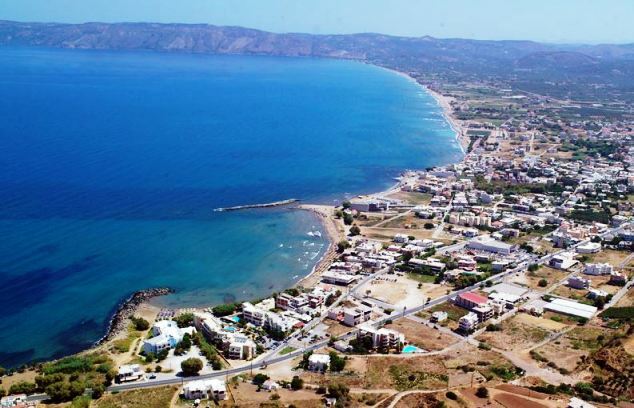 Getting to Cretan Towns - arrive into Crete via two international airports, a regional airport with Olympic Airlines and Aegean Airlines, and multiple ports, see details below for each town.